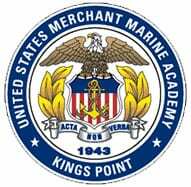 The United States Merchant Marine Academy located at Kings Point, N.Y. Established in 1936, and opened 1943, its primary focus is training of Merchant Service officers. Candidates must be at least 17 years of age and must not have passed their 25th birthday before July 1 in the year of entrance, receive a nomination from their U.S. Representative or Senator, and have qualifying test scores and grade point average. Upon graduation they receive a commission in the Naval Reserve as well as a Merchant Marine License, or a commission in any one of the other branches of service. NMMI serves as a preparatory school for the United States Merchant Marine Academy. The curriculum consists of English Composition, higher math, Chemistry, Physics, and Physical Education. The Prep Program advisor works with the cadets and the Academy to provide assistance and guidance help each prep student succeed in the academic arena, the Corps of Cadets and physical fitness. Upon successful completion of the program and recommendation from NMMI, the cadet will receive an appointment to USMMA.